If you’re wondering about the benefits of zinc or how effective it is, a study published in The American Journal of Clinical Nutrition in 2016 provides an update. The overall objective of this study was to assess the benefits of food fortification in modern societies. Changes in lifestyle and eating habits have had a significant impact on populations’ nutritional status. One such effect has been the development of deficiencies in some essential minerals and trace elements, deficiencies which are responsible for certain health problems. As a consequence, a number of methods have been developed to improve or restore a population’s nutritional status. However, they do not all offer the same efficacy and need to be evaluated. 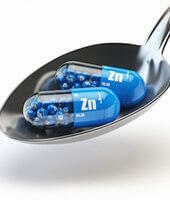 This study has demonstrated positive results for zinc supplementation. Until now, few studies had looked at functional markers following supplementation with zinc. In this six-week investigation of 18, zinc-supplemented males, researchers therefore analysed a number of indicators including total absorbed zinc, the exchangeable zinc pool, plasma and cellular zinc concentrations and zinc transporter gene expression. Other metabolic indicators were also taken into account such as DNA damage, inflammation and oxidative stress. Subjects had been given 6mg of zinc for the first two weeks, and 10mg for the remaining four weeks. Following supplementation, researchers observed an increase in the total zinc absorbed, though there were no significant changes in the other functional indicators. Nevertheless, the increase in zinc intake produced a decrease in DNA strand breaks. In addition, it not only restored levels of the proteins involved in DNA repair, but also re-established immune and antioxidant function. Confirming the importance of this essential mineral to good health and the benefits of zinc supplementation, these results demonstrate why a number of dietary supplements have been developed from zinc salts, such as zinc orotate, or patented forms such as the formulation L-OptiZinc® both of which are available from www.supersmart.com. Zyba SJ, Shenvi SV, Killilea DW, Holland TC, Kim E, Moy A, Sutherland B, Gildengorin V, Shigenaga MK, King JC, A moderate increase in dietary zinc reduces DNA strand breaks in leukocytes and alters plasma proteins without changing plasma zinc concentrations, Am J Clin Nutr, 2016 Dec 21, pii: ajcn135327.